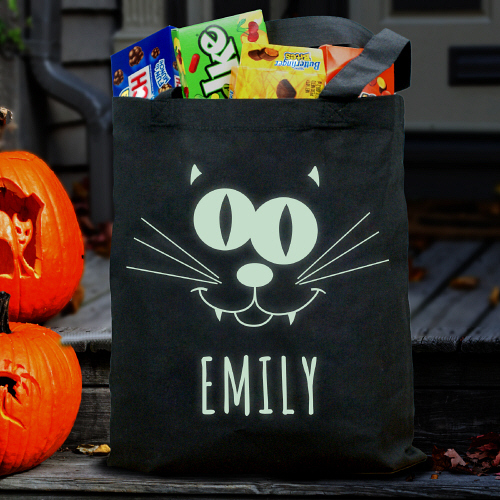 Frightful fun and spooktacular celebrations will ensure when your little one receives one of these cat-tastic glow in the dark Personalized Halloween Bags. 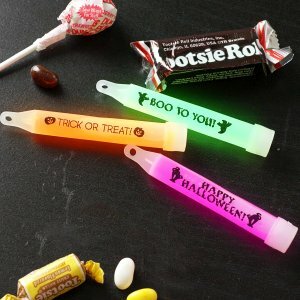 The eerie glow it emits on Halloween night will add to the ambiance of her fun-filled night of gathering candy. This glow in the dark cat design is printed on our premium black canvas tote bag. The tote bag is a cotton/poly blend and measures 16" H x 15" W. It is machine washable and includes free personalization of any name. It's very cute! I use it for decoration and to store other stuff! Great delivery and service! The bag is big enough to enjoy a few hours of trick or treating. My Granddaughter loves her bag and also the fact that it lights up. Additional Details Your kids are going to need large trick or treat sacks to hold their favorite candies and snacks! Our glow in the dark bag is large, unique, and perfect for your kids to use as they go around the neighborhood. We also offer this in a number of other designs!